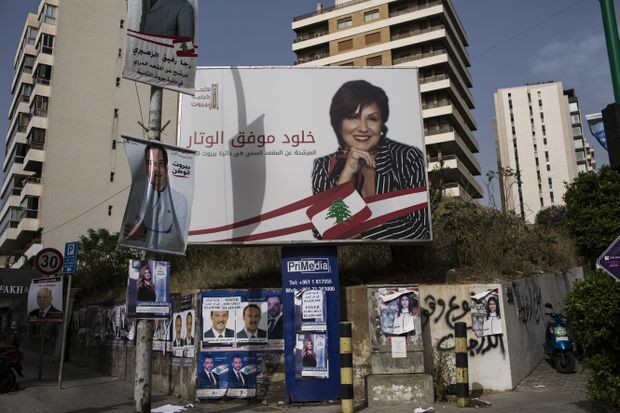 A campaign billboard in Beirut for election candidate Kholoud Wattar Kassem. There are only four women in Lebanon’s female-unfriendly parliament, where even the women’s affairs minister is a man. A record number of female candidates – 84 to be precise – are trying to correct that jarring imbalance in Sunday’s election. The wave of female – and mostly independent – candidates who want to break free of the old sectarian lines was nowhere to be seen in the previous election in 2009. Then, only a dozen women ran in a field of more than 700 candidates. The nearly all-male parliamentary bastion has held firm for nine years. Today, that bastion is under threat, even if the odds are stacked against the female candidates because of the peculiarities of the complicated new list-based, proportional voting system for the 128-member parliament, the small fortunes needed to finance campaigns – most of the women are not rich – and the general bias against women among voters and party bosses. Kholoud Wattar Kassem is a candidate in the largely Sunni “Beirut 2” district, one of Lebanon’s largest voting zones. As women, they face bemusement and often prejudice in their everyday campaigning. 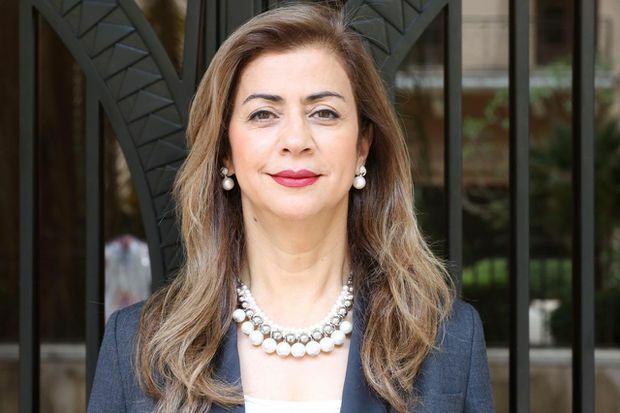 Fatmé Mouchref Hamasni is an independent candidate who, like Ms. Kassem, is running on one of the nine separate lists of candidates in the Beirut 2 voting district. Ms. Kassem and Ms. Hamasni know each other. They are both well-educated, multilingual professionals who married other professionals, raised three children each and lived privileged lives, relatively speaking – Lebanon is a poor country with a lot of rich people. They say they want to help society and promote women’s rights and female candidates – not an easy task in a male-dominated society. Ms. Hamasni notes that Iran-backed Hezbollah, one of Lebanon’s biggest political (and military) powers, has lobbied against introducing quotas for women in parliament. “They said a women’s place is in the home,” she said. Neither woman, both of them Sunni, had run for parliament until this election. Ms. Kassem, who is of Syrian background, was the only girl among eight children and grew up in a conservative household where women had no freedom. She rebelled against what she calls her “captivity” and received two degrees from the American University of Beirut, one in social sciences, the other in teaching. In recent years, she has been promoting the rather alien notion in much of the Arab world of women as political leaders. Since 2014, she has been the senior adviser for the Middle East and North Africa for the Women Political Leaders Global Forum, a Brussels-based network of female politicians. Both Ms. Kassem and Ms. Hamasni think it is less important that they are women than that they are part of Lebanese civil society, meaning they are not wedded to a particular sectarian party and its parochial ideology. The constitution recognizes 18 different religious sects and dictates that the president must be a Maronite Christian, the prime minister a Sunni Muslim and the speaker of parliament a Shia Muslim. In effect, both women believe in a “Lebanese first” policy that emphasizes equality, human rights, anti-corruption, the development of democratic institutions and quality of life in a country with decrepit infrastructure and broken health, energy, water, education and social services. 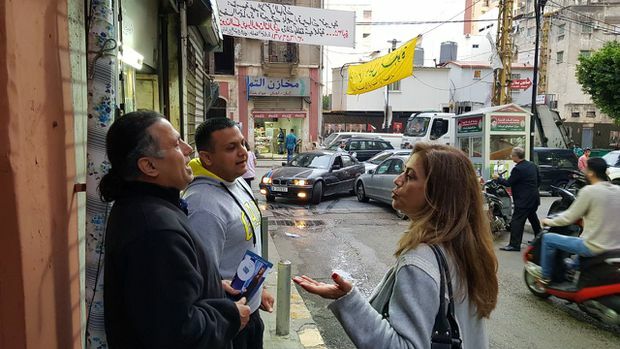 Ms. Hamasni speaks with two men while campaigning in Beirut. Holding back the women and civil-society candidates is the sheer cost of campaigning and the embedded corruption in the electioneering process. “You have to be filthy rich to run in this country,” Ms. Kassem said. All candidates – almost 600 made it onto party lists in this election – have to pay about US$5,500 just to register, a small fortune by local standards. Each candidate, or his or her supporters, also must pay for a polling station representative on voting day. That person costs about US$200 and oversees the actual voting process to ensure it runs smoothly and honestly. While some candidates share the cost of a representative, the large number of polling stations in any district – Beirut 2 alone has 580 – means the bill can be horrendous. It gets worse. If a candidate wants to appear on any of Lebanon’s half dozen private TV channels in an hour-long political program or debate, he or she has to pay the stations US$50,000 or more, a shake-down system that is not illegal. “I call this corruption by law,” Ms. Hamasni said. Still, the women and civil-society candidates are fighting on, banging on doors, attending rallies and trying to get as much media coverage as possible in a crowded field. Most of the female candidates won’t make it into parliament – and they know it. But even if a few of them win seats, they will be prepared to declare victory. Victory or defeat, Ms. Kassem and Ms. Hamasni consider themselves pioneers in a political system that is rigged in favour of nepotism, prone to backroom deals and dedicated not so much to the interests of all Lebanese but to the interests of individual religious sects and parties, a few of which are backed by Sunni or Shia powers in Saudi Arabia and Iran.